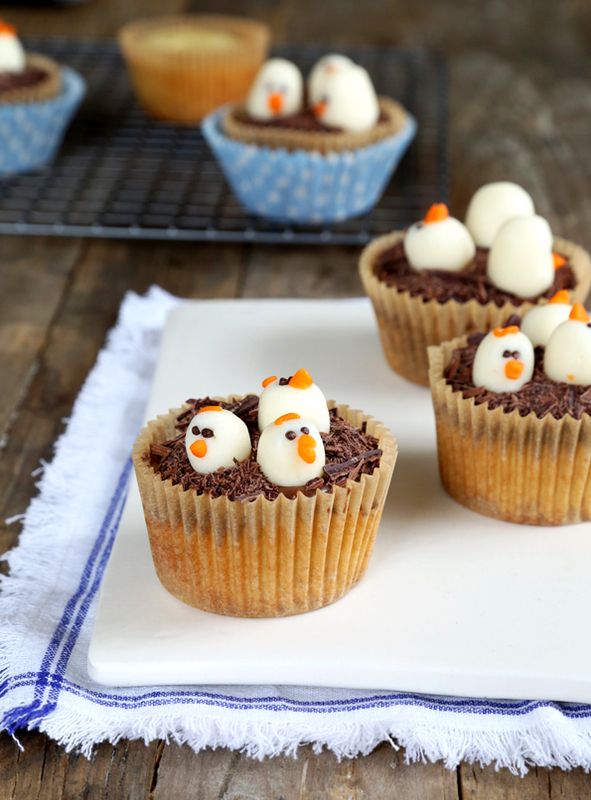 Gluten Free Easter Chick Cupcakes | Great gluten free recipes for every occasion. Now, I’m no cake decorator. I have never felt drawn to making those sweet little cupcake Easter baskets (something about the candy you use to make the handle just … leaves me cold). 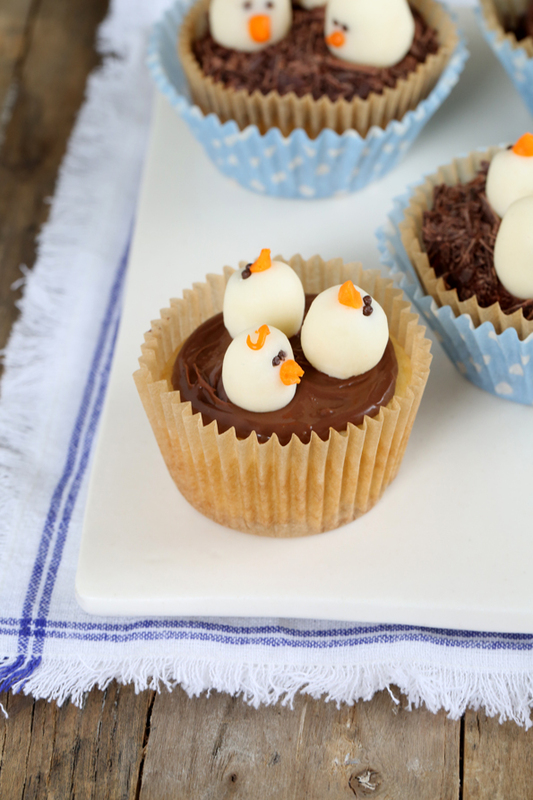 But I have been dreaming for years of a truly easy way of making cute little chicks to put atop some sweet little gluten free vanilla cupcakes for a fun gluten free Easter treat. I wish I were exaggerating, but I’m not. You know those speckled candy eggs you can buy this time of year? Well, they’re malt. Not exactly gluten free. 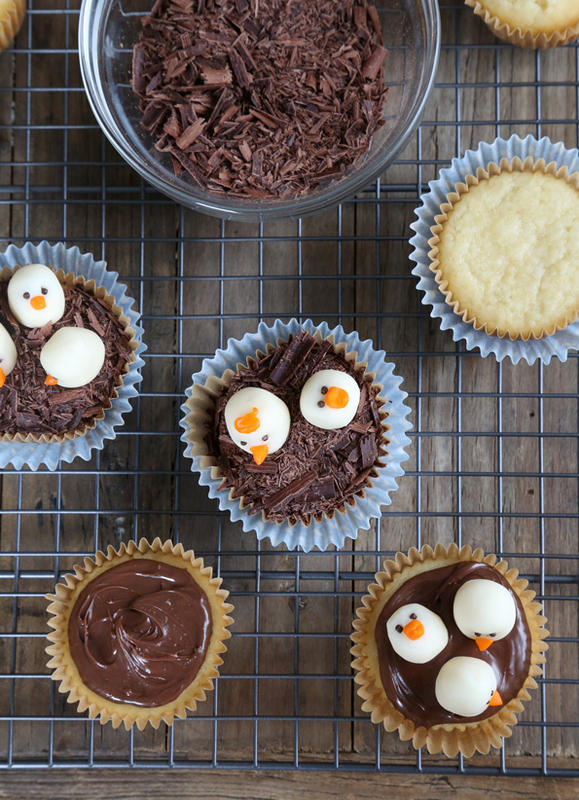 Enter the perfect gluten free vanilla cupcake … and super easy modeling chocolate. And you can even make the chicks ahead of time (it’s actually kind of good to have them dry out a bit before decorating with them, if you’re so inclined). C’mon. How cute are they? I promise they’re just so easy to put together. And it’s really nice to learn how to make and work with modeling chocolate. It’s similar to fondant, but it’s more stiff and easier to shape into figures like these little baby chicks. First, make the white modeling chocolate. In a medium-size, heat-safe bowl, place the white chocolate. Melt in the microwave in 30-second bursts or over a double boiler, stirring frequently, until the white chocolate is smooth and thin. Create a well in the center of the melted white chocolate, add the corn syrup and fold in the corn syrup with a wide silicone spatula in no more than 20 strokes. The chocolate will begin to seize and become harder to stir. The idea is to distribute the corn syrup evenly throughout the white chocolate without overmixing, which will lead to a grainy result. Pour the mixture out onto a large piece of plastic wrap in a thin, even layer (about 1/4-inch thick). Cover carefully with the plastic wrap to enclose the modeling chocolate completely. Allow the modeling chocolate to cool at room temperature for about 30 minutes or until it has become relatively stiff. While the modeling chocolate is cooling, make the cupcakes. Make the cupcakes. Preheat your oven to 350°F. Line 20 cups of two standard 12-cup muffin tins with cupcake liners or grease the wells, and set aside. In a large bowl, place the flour, xanthan gum, baking powder, baking soda, salt and sugar, and whisk to combine well. Add the butter, eggs, vanilla and milk, mixing to combine after each addition. Fill the prepared wells of the muffin tins about 2/3 of the way full with the batter. Place in the center of the preheated oven and bake until very lightly golden brown and a tester comes out with no more than a few moist crumbs attached (about 19 minutes). Allow the cupcakes to cool for at least 5 minutes in the tin before transferring to a wire rack to cool completely. Make the chicks. Remove the modeling chocolate from the plastic wrap, and knead until it begins to soften a bit from the heat of your hands (about 2 minutes). Remove about 2 tablespoons of the chocolate and knead in some of the orange food coloring until the color is even and vibrant. If you have disposable gloves, this would be a good time to break them out. Wrap the orange modeling chocolate in plastic wrap and set it aside. Pull off approximately 1 teaspoon-sized pieces of the remaining, natural-coloring modeling chocolate, and roll into balls between the palms of your hands. Press on end of each ball down a bit on one side so it has a base to stand on, and taper the other end into an egg shape. 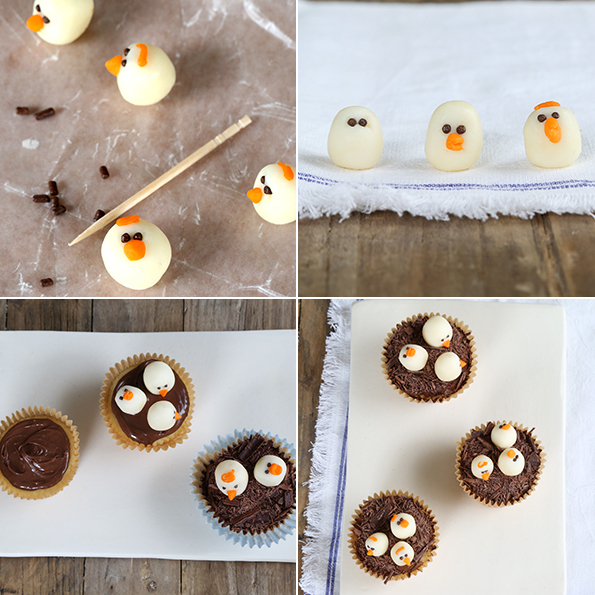 Beginning again with the first shaped egg, poke two small eye holes and fill each with a chocolate sprinkle. Unwrap the orange modeling chocolate, and pull off very, very small pieces to shape into triangles for beaks. Press the beaks into place on the eggs. Assemble the cupcakes. 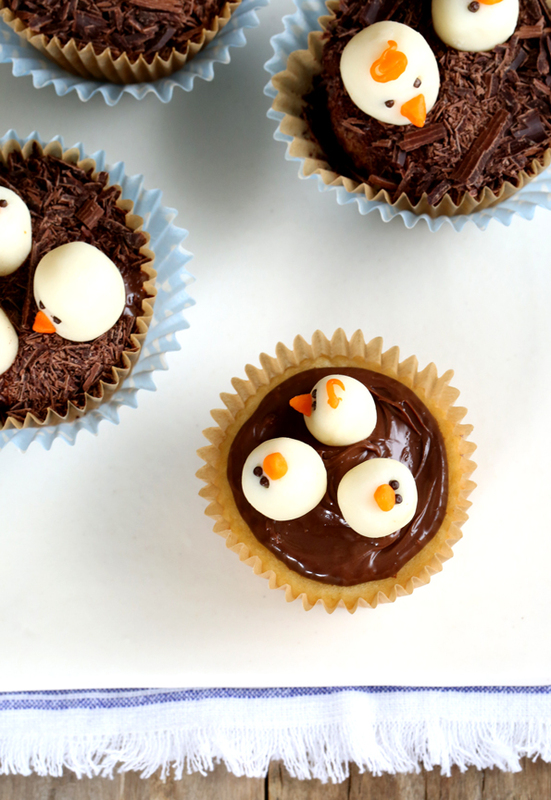 On each cooled cupcake, spread about 1 teaspoon of Nutella as “glue” to keep the chicks in place. Top with 2 to 3 chicks, and then sprinkle the shaved chocolate all around the chicks as a nest. Serve to your delighted family and friends. Inspired by Las Recetas de la Felicidad, from my Must Make Gluten Free Pinterest board. If you have questions about how to make the modeling chocolate, please see the Jessicakes blog. I did a lot of Internet research to learn how to make and work with it, including more youtube time than I care to admit, but that post was by far the most useful. sharing this one on the Orgran Facebook page, and Candy Tree – you can use Candy Tree Gluten Free Licorice Laces as decorations on the cup cakes. Looks like he’s got you painted into a corner, Rachelle! I’ve probably said this before but you are AMAZING!!! I was just looking thru recipes last night trying to find SOMETHING cute and gluten free for my daughter’s Easter Party at school. THIS IS IT!! They are too cute and she can eat every part of it. Thank you. Thank you. You brightened my day. If anyone wants eggs in their nest, they could use the M&M speckled eggs. Those things are so cute and tasty! One of the chicks up there looks very sad and worried. I think he knows his destiny. Thanks for posting that info, dot. I know that most of those fancy M&Ms aren’t safe. Better off making these little chicks. They really are easy! Cool, Jennifer. I am currently IN Vegas for business! wow! great to have some time away – I bet. Our is a family deal – my SIL lives in Vegas.